The basil dressing makes this salad. It’s so flavourful and works well with all the other ingredients. 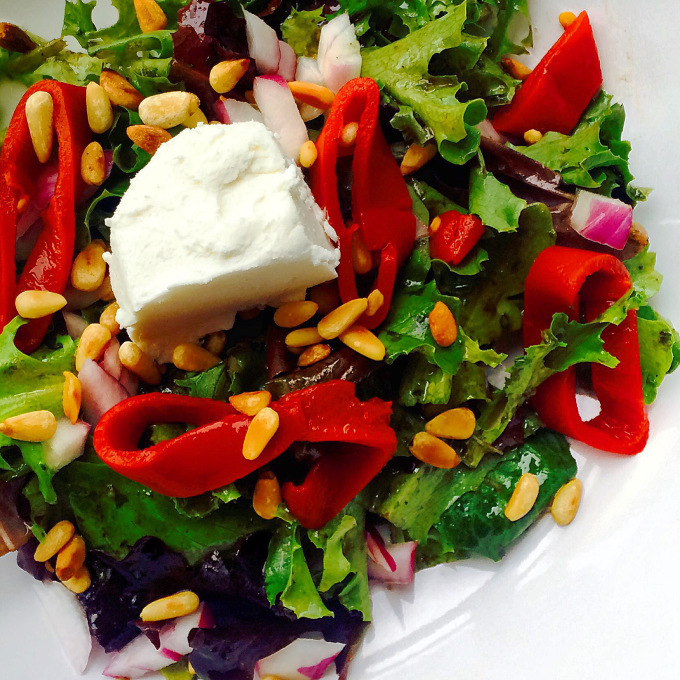 You have the creaminess from the goat cheese, the crunch from the pine nuts, the sweetness from the roasted red peppers, and the sharpness from the onions. It’s one of my favourite salads and with some roasted chicken, one of my favourite meals. In a small pan on medium heat, toast the pine nuts. Stir occasionally for about 5 minutes, you will start to smell them and they will brown slightly, that’s how you know they are ready. Take off heat and set aside. On a plate, make a bed of greens with the spring mix. Add some slices of roasted red pepper, scatter some of the red onions, and top with a piece of goat cheese. Sprinkle the toasted pine nuts onto the salad. In a blender, add all the dressing ingredients and blend till smooth. Pour over salads and serve. Keep left over dressing in the fridge for up to a week. This is not a family style salad. You assemble the salad on each plate. I made this for 2, but if you have more to feed, it is easy to double or triple the recipe. The dressing is a keeper. You can put it on anything. It will only last a week in the fridge, but it’s so good you’ll probably finish it in a few days. One of my favourite additions to this is roast chicken. I also cube up a chicken breast and marinate it with salt, pepper, and oregano, fry it up and add it to the salad. Beef or lamb would also be a good accompaniment to this salad.